Goose on the Rocks is a very unique mobile bartending service that offers the luxury of a private bartending team; in addition to the support of cost cut planning and focus on alcohol management and consumption. Essentially, we provide an overall luxurious event atmosphere at the most affordable price. We service all of San Gabriel Valley, Los Angeles County, Orange County and surrounding areas. Our Mission: For our clients to enjoy their special day and let us manage the bar. Goose on the Rocks; also known as G.O.T.R. was named after an intelligent and social bird. We at Goose on the Rocks like to believe our team is formed with the same type of personalities; sociable and intelligent. Benson attended National Bartending School of Covina, CA. He was certified in October 2006 and began working his first bartending job at Royal Vista Golf Club in Walnut, CA. After months of experience perfecting the trade behind the bar for their special event banquets; Benson soon began freelancing. Through his own advertising on classifieds, social media and various referrals; Benson freelance his bartending capabilities until he developed a process and procedure to best serve his clientele. On January 1st, 2010 -- Goose on the Rocks was born. Benson finally branded his Private Bartending Services as Goose on the Rocks, with the help of many friends who engaged him with logo design, website design and lots of support. Through 2011-2014, Goose on the Rocks began training new team members who could duplicate its special services it prides itself with. At the same time, Goose on the Rocks continued to maintain a great reputation on social media; specifically Yelp. It also improved its process and procedures to ensure quality customer care, efficient service and cost effectiveness to its growing clientele. GOTR 2.0 || Same Brand, Same Mission, New Look. 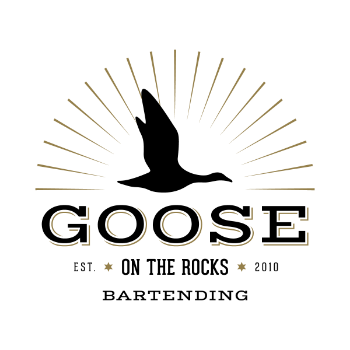 After a great 5 years of tremendous success, Goose on the Rocks updated its logo to show maturity and growth. At the same time, it continued to share it's culture and vision to both clients and new members. GOTR 2.0 signifies that although it has shifted cosmetically; its pride remains regarding it's ever improving services. Goose on the Rocks is set to launch their official training program for new team members. As we grow, we want to be more available for our growing clientele. To do this, we started Goose University to onboard reliable, trustworthy and qualified applicants to join our team.